Actor Amrish Puri died at the Hinduja Hospital in Mumbai on Wednesday following prolonged illness, hospital sources said. Puri suffered a blood clot in the brain and slipped into coma, the sources said, adding he was also being treated for malaria. The actor had undergone a surgery last week. Initial reports had suggested that the actor, who is survived by his wife, a son and a daughter, had died of brain haemorrhage. The funeral is likely to take place on Thursday, the sources added. Puri was born on June 22, 1932 and made his Bollywood debut in 1971 with Reshma Aur Shera. The younger brother of character actor Madan Puri, he initially screen-tested for a hero's role in 1954, but the producer rejected him. He then turned to theatre and also lent his voice to several advertisement jingles. After Reshma Aur Shera, he had to wait a long time before filmmaker Shyam Benegal offered him roles in films like Nishaant, Manthan and Bhumika. 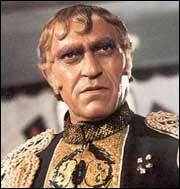 His career-defining role came with Mr India in 1987, as Mogambo. The line, Mogambo khush hua, became one of the most famous in the history of Hindi cinema. He also acted in Steven Spielberg's Indiana Jones and the Temple of Doom. Aitraaz was his latest release.